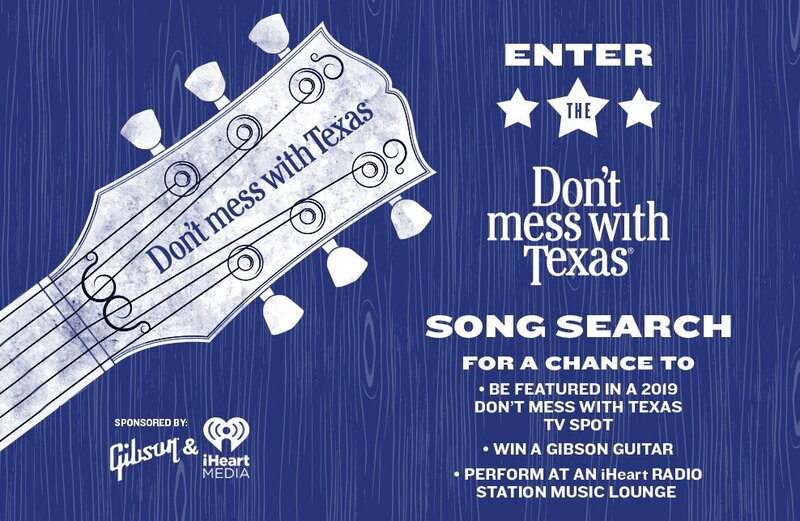 Don’t mess with Texas® is hosting a Song Search Contest to find the next undiscovered musical talent in Texas to feature in the iconic litter-prevention campaign. The Song Search Contest will continue the tradition of music being a part of “Don’t mess with Texas” since the campaign’s inception 32 years ago. Contestants enter by uploading a 30-second video featuring an original song or lyrics that incorporate “Don’t mess with Texas” and its litter-prevention message. The videos will be uploaded to Dontmesswithtexas.org where the public will have a chance to vote for their favorites. At the close of the public voting period, three finalists will be selected, and later, two final winners will be announced, one English and one Spanish. The winners will earn a prize package that includes: a 2018 Gibson Guitar, donated by Gibson Brands and valued at $2,400; a performance at an iHeart Live Music Lounge, donated by iHeart Media; and the chance to appear in a future “Don’t mess with Texas” campaign TV spot. The submission period will run August 29, 2018 through October 10, 2018. Visit dontmesswithtexas.org to view the Official Rules and submit your video!